As we had got to know Vietnam through her appetite, individuality and spirituality, it was now necessary to get deeper into her thoughts and understand the control mechanisms that govern her daily life and decisions. It’s difficult to label Vietnam simply ‘Communist’, without understanding how it came to this decision and political positioning. Having experienced oppression from their Chinese neighbours for a thousand years, Vietnamese dynasties, the French and briefly the Japanese, there was a vacuum of leadership like many of the Japanese occupied countries after World War II. The country was divided north and south similar to Korea, along a latitude line. The North been influenced by communist Russia and South the democratic USA. Hoh Chi Minh, the first leader of the North, had spent decade’s abroad, learning the philosophies of Karl Marx and joining the debates in Paris in 1911. He returned to Vietnam enthused and determined to create an independent communist country, free of tyranny and apparent evils of capitalism. Determined to unite the country, the Viet Cong, led by Hoh Chi Minh organized forces and launched a war on the South. After twenty years of fighting, hundreds of thousands dead, the landscape and heritage destroyed, the South reluctantly joined the North, while the Americans made a brisk exit. 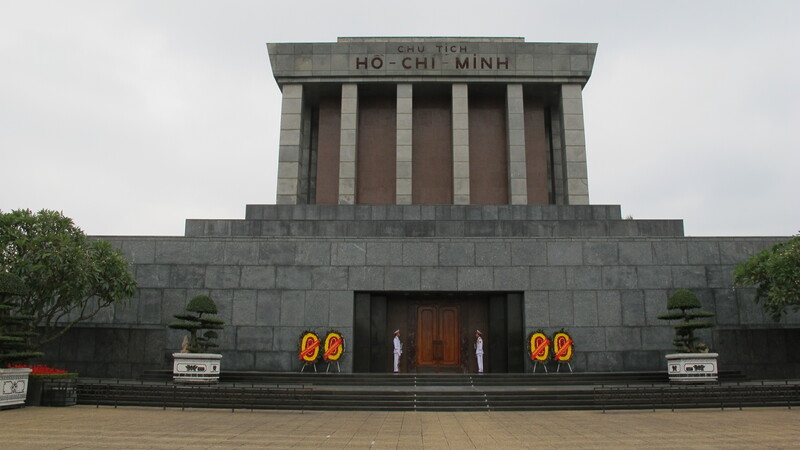 Hoh Chi Minh died during the war, but his efforts are seen as fundamental to creating this independent country. Although he wished to be cremated, his body lies now in repose, similar to Mao and Lenin as a constant reminder of the foundation of the country and more cynically I believe as a controlling symbol to maintain the power of the Communist Party. Hoh Chi Minh is knit into every fabric and molecule of living Vietnam, his face is on the currency and his picture even hangs over the ancestors on the family alters. He is affectionately known as uncle Ho Chi, and even appears on cartoon billboards requesting its citizens to be better communists. So while the original founders of communism in the Soviet Union have given up on the social experiment and China risks imploding with any major changes to the governance, the Vietnam Communist party still clings tightly to this archaic method of control. 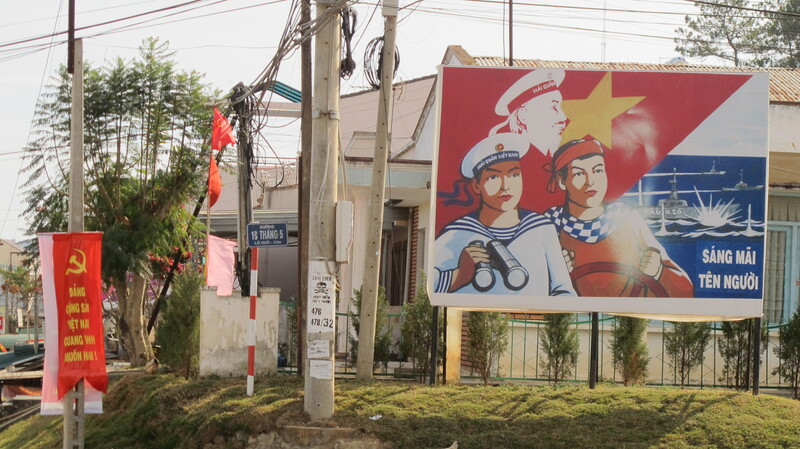 The Vietnamese people are fiercely proud of their country and what they have achieved with the national flag hanging proudly on every building, street corner and home, but this is also a requirement by the communist party, suggesting a sense of insecurity underlying the appearance of unification. It’s difficult to ignore the control the Party has, with morning announcements in every town (at 6-7am), broadcasting through loudspeakers on the streets asking people to ‘work hard for the party and the party will work for you’, it’s disguised as a sort of public radio, but still acts as an instrument of propaganda. One morning, as we cycled through the countryside we heard the propaganda speakers preaching to an empty road with pictures and messages strapped to telephone poles on the best way to life and to how best to support the party. I wondered, after experiencing the dearly earned democracy of South Korea, is change inevitable? And what will be the catalyst that will initiate this? In South Korea, as citizens income increased, so did their desire to be governed in a fair and democratic way. One party governance has many flaws, lack of accountability and susceptibility to corruption been the main ones. The most recent scandal to be revealed, involved a government official accepting a bribe from a Japanese company. They were bidding for the high-speed railway that Japan was investing a billion US dollars in. This revelation resulted in Japan withdrawing it’s funding and leaving a vacuum in the already strained infrastructure. Although the majority of business is done in the south in Saigon, the ‘old money’ is in Hanoi (the Capital), where officials accept other means to up lift their civil servant salary. 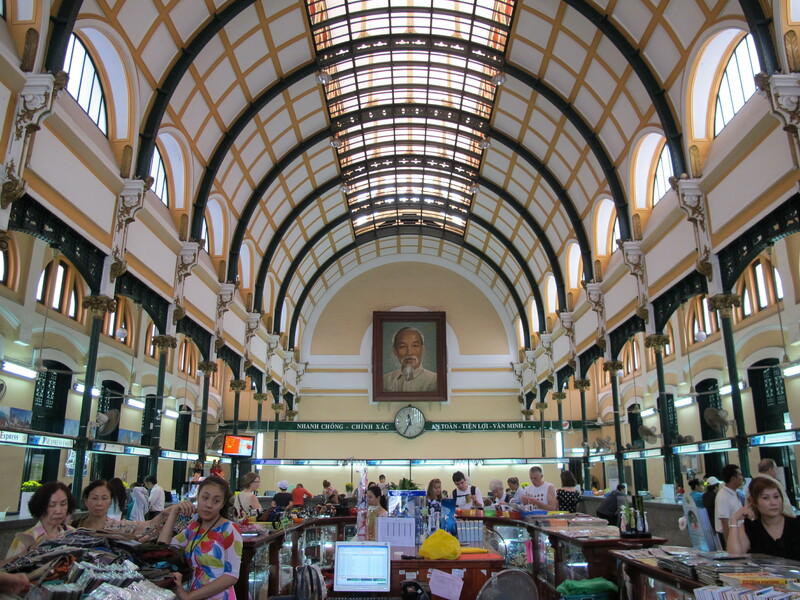 The post office built by the French in Saigon, with the ubiquitous picture of Hoi Chi Minh that presides over all public spaces. It’s also worth considering if Saigon would have taken a different development path if the Americans had managed to help defeat the communists. Before the war, Saigon was a more thriving city then Singapore, with the latter now earning $56,000 GDP per capita and Vietnam a paltry $2000. Understandable there is growing concern in the communist party over Bloc ‘8406’, a pro-democracy dissident group formed from young educated professionals formed on the 8th of April ’06. From some of the conversations we had in Vietnam, there is a growing discontent with single party governance, but to express publicly this dissatisfaction could position you behind bars. So, what has communism achieved for Vietnam? In the early 80’s after the government had less than ten years to carry out it’s social experiment, Vietnam was impoverished and on the way to starvation and collapse. It had lost its ally after the collapse of USSR and was forced to mend fences with the long resented neighbour of China. In ’92 with three people required to do one job in the civil service, the country changed from a subsidized economy, open to foreign investment. Since this modification of communism, the country has made great strides to ‘modernize’ in our understanding of the definition. The Year 2000 was significant, after the embargo by the US was lifted and an attempt to normalize relationships, the first visit by a US president was made by Bill Clinton. 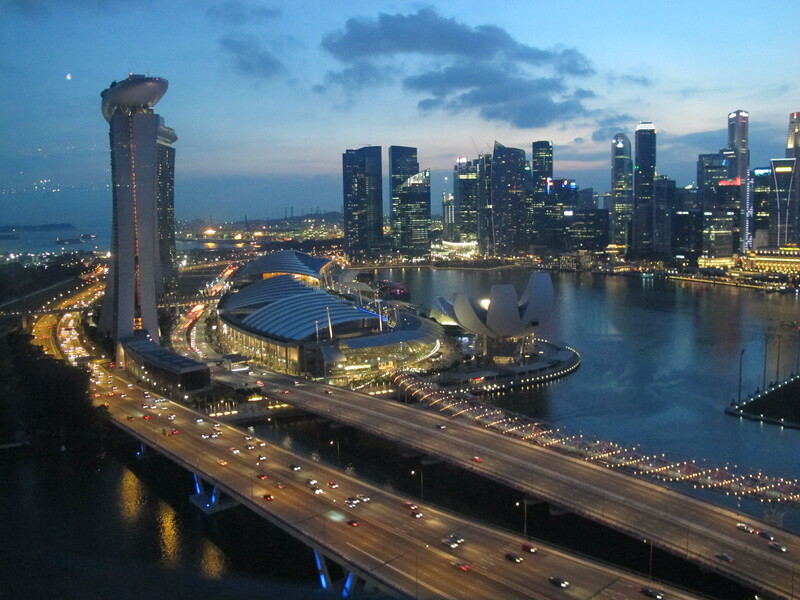 Economically, it’s considered the Asian Century, with an increased interest in the summits of Asean (the group of South East Asian States). Although not as organized as the EU (this could be seen as an advantage), everyone wants to sit in on the proceedings to see what’s going on. The relationship with the US is very good now and they’re willing to support Vietnam against the aggressive moves of China, but they also cannot appear to be too close to this previous enemy, for fear of aggravating the communist big brother. The people of Vietnam do not know what the government spends on the military, but I’m sure it’s too much. This entry was posted in Vietnam and tagged Communism Vietnam, Corruption Vietnam, Ho-Chi Minh. Bookmark the permalink.